"In the past, during our grandparents' generation, and maybe even during ours today, there were people who forbade children from reading manga because they thought it'd make them stupid. But manga is gradually starting to be accepted as a kind of art. So we ought to create something whose quality and content can uphold this pride. We don't have the skill for that just yet, though, so we've got no choice but to think of how to win the love of our readers while we make our stories." Manga (kanji: 漫画; hiragana: まんが; katakana: マンガ). Japanese comic books and print cartoons. The chapters of a manga are usually first serialized in some weekly or monthly anthology magazine targeting a specific demographic, then collected in bound volumes known as tankōbon. 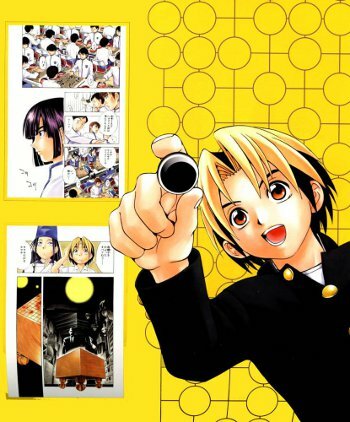 Due to the expense of color printing, the vast majority of manga is drawn in black and white. A high proportion of anime are adapted from these, so many of the Japanese Visual Arts Tropes got their start here. Sometimes, an existing anime series gets a manga adaptation; see Anime First for examples. Officially manga should be read right to left, unless the manga was flipped during its English printing, which rarely happens these days, although there are exceptions. If reading flipped manga, that the effect is slightly different as speech bubbles may feel inappropriately placed, or the eye may not follow the action so effectively as each page is turned. The last page of manga books that are published in the US usually consist of instructions concerning the proper way to read manga books, though some publishers dont include them any more. Korean-made comic books (called "manhwa"), however, are generally read from left to right. Some manga scanlation sites have started showcasing a few manhwa, leading to some confusion in reading order when readers assume them to be Japanese manga. Chinese comic books are known as manhua; more traditional ones are read from right-to-left like manga, while more modern ones are read from left-to-right; they also tend to be in color, like mainstream American comics. It should be noted that the term is getting a broader meaning in certain countries than it once had. In France for instance some publishers make manga based on French comic books, which means that they reprint a comic book to be in black and white and to be read from right to left. The fact that it is actually hard to distinguish from real manga (even the bookfront is similar) and therefore selling about as well in native France will make it a popular practice for at least as long as manga itself keeps being popular there. See also UsefulNotes/AnimeAndManga, Doujinshi (self-published manga), Manga Demographics (including Josei, Kodomomuke, Seinen, Shonen, and Shoujo), Manga Effects, Mangaka (manga authors), Manhwa (Korean), Manhua (Chinese), OEL Manga (English), and Web Comics (digital publishing). Bakusou Kyoudai! Let's & Go!! Binan Koukou Chikyuu Seifuku-bu LOVE! The iDOLM@STER 2: The World Is All One!! I Dont Like You At All, Big Brother!! My Part-Time Job Is at an Evil Organization?! No Matter How I Look at It, It's You Guys' Fault I'm Not Popular! Pokémon: Diamond and Pearl Adventure! Uchi no Musume ni Te o Dasu na!